In a discussion following my blog 5 million non-Jewish victims? (Part 2), our reader "HLAPOT" remarked that, as concerns the Soviet Union’s human losses during the Second World War, there is at this point in time a demographic estimate (the one presented by Michael Ellman and S. Maksudov in their 1994 article Soviet Deaths in the Great Patriotic War: A Note) that "lacks a satisfactory explanation", i.e. is not or insufficiently substantiated by evidence-based death counts. This apparently remains true more than 1 ½ decades after Ellman and Maksudov’s article. 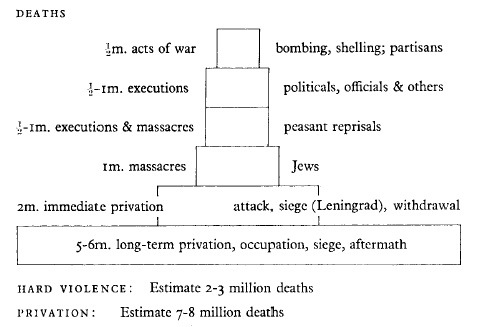 A solid scientific breakdown of the enormous figure of almost 27 million excess deaths in the Soviet Union during the "Great Patriotic War", especially as concerns the civilian component, has to my knowledge not been provided by historiography so far. According to preliminary calculations made by one of us ( ' 0 frontovykh . . .', p. 119), deaths from the German occupation (killing of Jews, deaths in the siege of Leningrad, deaths of civilians resulting from the fighting, excess deaths in the occupied territories resulting from the deterioration in living conditions) were about 7 million. Of these, about 1 million were in the siege of Leningrad, and 3 million were Jews. Of the latter, about 2 million were Jews from the newly annexed territories, and 1 million Jews from old Soviet territory. Excess deaths from the deterioration in living conditions in the non-occupied territories seem also to have been about 7 million. Soviet repression (deaths in camps and among the deported nations) probably claimed about another 3 million. In addition there was a population loss of about 2 million as a result of emigration, mainly to Poland. These are rough preliminary estimates on a topic which still awaits serious research. This desideratum of historical research makes it interesting to look at a breakdown made in 1972 by a British writer named Gil Elliot, without the benefit of sources that only started becoming available almost 20 years later following the breakup of the USSR. The following text was transcribed from pp. 54-59 of Elliot’s Twentieth Century Book of the Dead (1972 Charles Scribner’s Sons, New York). Leningrad 1941-3 was the first living city to become a city of the dead. As at Verdun in 1916, half a million people died in the first four months of onslaught – of hunger and disease as against shells and bullets – followed by a year’s struggling attrition bringing the total dead to over one million. As Verdun, the Somme and the rest were metropolises in a wider area of death, so Leningrad was a concentration of one million out of a total of ten million civilian deaths diffused over Russia 1941-5. The two big wars of our century have a broad pattern or rhythm in common, inherent in the scale of operations: the initial series of attacks bringing massive loss of lives; the ‘bogged down’ period of combat lasting several years and causing the major attrition of human life; and the period of final retreat and withdrawal. We may adapt this pattern to the case of the civilian population of Russia in the Second World War. Bombing of towns and cities was part of the terrorizing attack, as well as killing old ladies and other roadside refugees with machine-guns fired from aeroplanes (‘strafing’ as it is joyfully called). Probably most deaths among refugees were from the immediate effects of exposure and starvation. Large collections of people found themselves in strange towns being caught up by the invaders, unable to move on, waiting in captive but neglected groups where disease was added to hunger and homelessness. When towns were occupied, and even some villages, a small number of potential troublemakers were immediately shot or hanged; ‘troublemakers’ of course being those people, officials and political commissars, who kept order before the invaders arrived. All of these types of violence probably accumulated to about half a million civilian deaths in the short brilliant surge of the military machine. In the occupation period the logic of the total-war machine completes itself. Not in random atrocities such as make scandals in the newspapers but in the application to the civilian population of the same pressure which is the theme of the military war: attrition. The scale of disruption in Soviet towns and cities is indicated by the fact that many of them, at liberation, contained between one-half and one-third of their pre-war populations. On the basis of twenty million people in towns in the occupied area: about two million would be in the armed forces; probably around two million left the towns, including those who fled out of the occupied area, those who joined partisan units and workers moving east with their factories. Four million people were deported as slave labor to Germany. Altogether, forty per cent or eight million people. About forty per cent were left in the towns at liberation, and something in the region of twenty per cent died in the process of occupation. My own estimate is four and a half million. About three million of these people, containing a preponderance of old people, women and children, died from want and neglect. Rations were meager, and often subject to arbitrary lowering or complete cutting-off by the occupying administrators. Apart from a weakened resistance to common ailments through lack of food, disease often reached epidemic level and hunger often reached famine level. One million people were killed because they were Jews. About half a million people were executed over the period because they were political commissars or officials, saboteurs or partisan suspects. There was also a good deal of killing for killing’s sake. In South Russia some thousands of old people were killed on the pretext of ‘euthanasia’. Deaths in the villages are not so easy to estimate. I have assumed that the slow attrition of hunger did not operate in the villages, on the principle that food producers have to be kept alive (an example of Nazi idealism). Thousands of villages were destroyed, burnt and the inhabitants shot as ‘reprisals’ for partisan activities. The partisans themselves were shot when captured. It is easy to exaggerate the accumulated total of deaths occurring in a multiplicity of small groups. Nevertheless it seems likely that the total number of peasants and partisans, shot and dying in the immediate privation of homelessness, was at least one million, a majority peasants in their homes rather than partisans, and most of them actually shot. The numbers accumulate … There is always uncertainty about the exact figures in a massive area of death. But when you look at the available evidence for each different type of death in turn, the numbers accumulate to an unshakeably correct order of magnitude. We now have five and a half million in the towns and villages in the occupation period; plus the half million deaths in the invasion period and the one million who died in Leningrad. Seven million civilian deaths in the periods of invasion and occupation. The violence of the invader army towards the civilian population was more severe in the retreating phase than it had been in the period of advance. In the course of the war eight million Russian houses were destroyed, and a high proportion of these were during the withdrawal from Russia. Crops and livestock were burned on a vast scale. Special systems and machines were used to destroy crops in seed, and growing crops were burned. Spring and summer. Before leaving the towns and villages the invaders commonly put to death the prisoners they had on hand in their jails. This was not a new phenomenon. In Moscow in 1920, when the death penalty was abolished, the Moscow secret police in one night executed a large proportion of their prisoners, presenting the government in the morning with a fait accompli. One writer has called this ‘liquidating their stock’: a case of ‘occupational psychosis’. Here of course the psychosis and the killings were on a vaster scale. It is likely that in the immediate privation of wrecked homes, destroyed crops and livestock and purloined food supplies, and in the farewell executions, about one million people died. ‘Aftermath’ is supposed to mean stubbled fields and storehouses packed with grain. In the aftermath of this wreckage, the death environment created over three years by the invader army, and their parting blows of destruction, probably at least another two people died in Russian towns and villages over the next year or so, from slow privation. According to demographic calculations, a total of 26.6 million Soviet citizens died in the "Great Patriotic War" – among them 3 million Soviet prisoners of war, 2.4 million Soviet Jews and another 500,000 people who perished due to the partisan war. 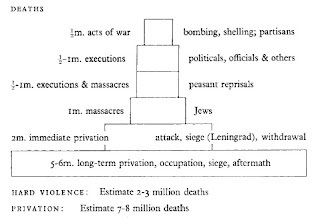 The number of Soviet Jews given by Hartmann (his colleague Hans-Heinrich Nolte speaks of 2.6 million murdered Soviet Jews out of 2.7 million who fell under German rule) shows that Elliot’s estimate of murdered "Russian" Jews was way too low, though it coincides with Ellman & Maksudov’s figure for Jews from old Soviet territory (as opposed to those from areas annexed to the Soviet Union in 1939/40). On the other hand, the enormous difference between the demographic estimate (26.6 million) and the sum of Hartmann's partial figures (5.9 million) is further confirmation that Elliot was right about the predominance of deaths due to privation over deaths from what Elliot called "hard violence", and that historiography remains uncertain about where and due to what causes most Soviet civilian victims of the 1941-45 war (estimated at 9-11 million by Elliot and 14-17 million by Nolte and by Ellman and Maksudov) lost their lives. Conjectural though Elliot’s 1972 breakdown may be, it comes across as a more detailed realistic breakdown than has so far been provided in academic publications by historians. Unless I missed something, historiography's best throw so far can be found not in an academic publication but on the Axis History Forum, namely in Dr. Nick Terry's OP on the thread Soviet Death Toll in WWII As A Whole. Unfortunately some of his sources are encyclopedia articles. These in turn rely on Soviet books which probably rely on the Extraordinary Commission. So, all in all, not the best estimate. And it's the part of the 27 million est. Anyway, take this info for what it's worth. The above numbers are for "deliberately exterminated on the occupied territories". For death from privation etc. the authors give as 8.5 million. They rely on an article in Sotsiologicheskie issledovania without naming the author (I know that Maksudov published in Sotsis, so maybe it was his article). Roberto, an "off-post". A friend of mine sent to me a video Jehovah's Witnesses with a Hitler's speech about them. He asked to me if someone who understands German could confirm the authenticity of this video, if Hitler's speech in German coincides with the contents of the subtitles in Spanish. Speech in german, subtitles in spanish. Roberto, the contents of Hitler's speech have nothing to do with the subtitles. Hitler is speaking about the history and achievements and glory of the National Socialist Party and how it will shape Germany in the future. There is nothing in the speech about Jehovah's Witnesses. thanks for the response of the video Jehovah's Witnesses, were wary of the legends are false, and was correct. The 27 million figure of course also includes perhaps 3 million people whose deaths can be attributed to Stalin. The Soviet documents that have been released on ITL, ITK, labor army, and special settler deaths are incomplete. For one thing they do not tend to show deaths in transit. Also deaths in special settlements don't appear to have been recorded for the Russian-Germans until 1945. But, the deportations took place in 1941.Most of the deaths would have occurred in 42-43 yet there have not emerged any records quantifying this mortality. The Soviet documents themselves admit to grossly incomplete record keeping regarding deaths among Russian-Germans conscripted into the labor army to work in various GULag camps. See for instance N.F. Bugai, _Mobilizovat' nemtsev v rabochie kolonny...I Stalin_ (Moscow, 1998, pp. 138-139). We are left with a lot holes. But, realistically the figures for things like deportations under Stalin are higher than you are positing. According to D.M. Ediev the excess deaths for those people deported in their entirety during the war. That is Russian-Germans, Karachais, Kalmyks, Chechens, Ingush, Balkars, Crimean Tatars, Ingrian Finns, and Meskhetian Turks alone is over 400,000 people. That does not include Lithuanians, Latvians, Estonians, and Ukrainians. As a minimum we are probably looking at a minimum of 500,000 deaths due to deportation, special settlement, and service in the labor army. But, a figure of 600,000 is not unreasonable. Other things that should be factored in are Soviet execution of deserters. Deaths in ITKs and prisons not just ITLs. This brings the number of deaths up considerably. Deaths in PFLs should also be included for that matter. All told a figure of 3 million Soviet citizens (as defined by the Soviet govt.) dying in various forms of captivity, exile or through execution is quite probable. Roberto, thank you so much for this clarification.